A garage door is the most important part of your garage and a substantial part of your home. 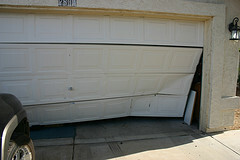 Damage to your garage door is not only a serious inconvenience, but also a security risk. The garage will probably not be functional, your home may look bad, and the contents of your garage could become vulnerable to theft and further damage by the elements. Contact your insurance provider ASAP in the event of garage door damage which you believe should be covered by your homeowners policy. They will probably tell you to get in touch with a number of professional garage door repairmen and receive estimates. The next step is to arrange for an adjuster to come and evaluate the damage. Many insurance policies have time limits on the amount of time that can pass between the incident of the damage and the filing of the claim so don’t push it off. Inspect your garage door thoroughly and take photographs immediately. Factors at the site of the damage (such as standing water, for example) can change with the passing of time, so it’s important to have evidence to present to the inspector. Additionally, while you should protect your home from further damage, be sure not to make any extensive repairs before your claim is accepted. There are many potential repairs that a garage door can require due to a host of different causes. The extent to which your homeowners insurance will cover the cost of the repairs depends on the policy you have. You will have to pay the deductible and any amount that exceeds the limit your policy covers. If the damage was caused by something not covered, such as earthquake damage, you will have to hire a contractor and pay for the cost on your own. Be aware of what kind of homeowners insurance you have and determine whether the source of the damage fits the claim. For example, flood damage incurred as the result of a hurricane may be excluded, while wind damage is covered. Additionally, most policies don’t cover the typical aging and wear-and-tear damage that require periodic maintenance. Read your policy carefully to make sure you understand what you are covered for. It’s always important to weigh the cost of the garage door repair against the amount of deductibles and potential elevated insurance premiums. It’s usually not worth filing claims for inexpensive repairs, though you should calculate the minimum cost that’s worthwhile to claim for your policy. If the garage door was damaged by a visitor's vehicle, repairs may be covered under the other party's liability insurance rather than your homeowners policy, depending on the circumstances of the accident. If you have a disputed claim, be sure to keep detailed notes of conversations you have with experts and with insurance company personnel, including names and dates, as well as receipts for all expenses incurred due to temporary repairs or interim solutions. If you wish to contest the insurance company’s evaluation, have the company cite the language in the claim from which they are basing their decision. If you still disagree, contact a mediator or an attorney.